Ragavi and Ragini came to our HoPE Learning Center in Eari in need of stability, friendship and guidance. Now they are best friends who make beautiful flower garlands, birds and animals out of colored paper. They have brought much joy to others in their families and village by hanging their colorful creations all over, inside and outside of local buildings. Ragavi thinks that she would like to one day become a teacher. Ragini is not yet sure what she would like to do, but both girls have a couple of years to think about this and with help from HoPE Center teachers, the sky is the limit. 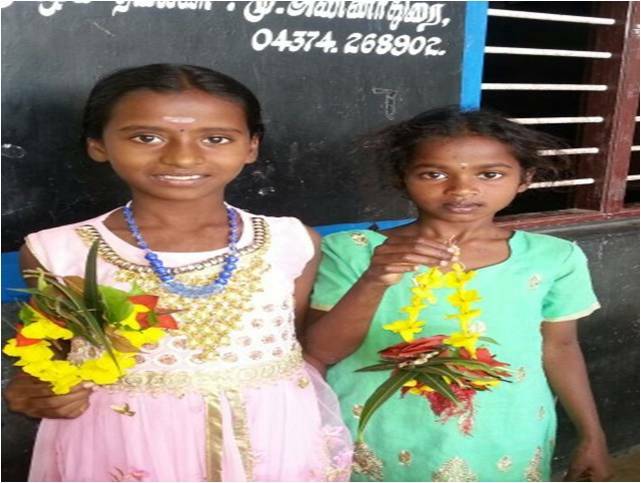 Your generous contributions to HoPE Learning Centers help children like these two artistic girls figure out what they would like to do with their lives and how they would like to best help[ transform the lives of others around them. A monthly contribution of only $10 covers all expenses for one precious child. A monthly gift of $350 helps 40 children.